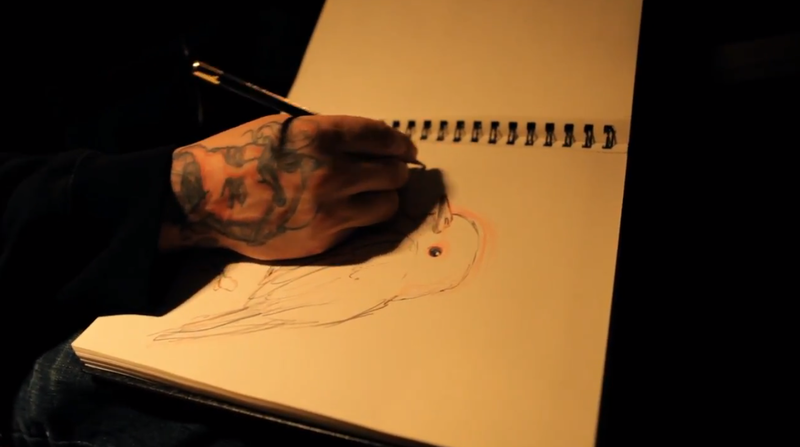 Last month’s Live on the Plaza introduced us to tattoo/fine artist Josh Reynolds. The avid Adult Swim fan and devoted father spoke to us about how painting informed his growth as a popular tattoo artist in Oklahoma City. Don’t forget to make it out to Live on the Plaza this Friday. It should be a barrel and a half of good times. Oklahoma City-based artist, graphic designer and everyone’s favorite Mule bartender Jason Pawley hopped in the van at last week’s Live on the Plaza to discuss his art and striving to be a full-time artist. Make sure to come out this Friday for another great Live on the Plaza. 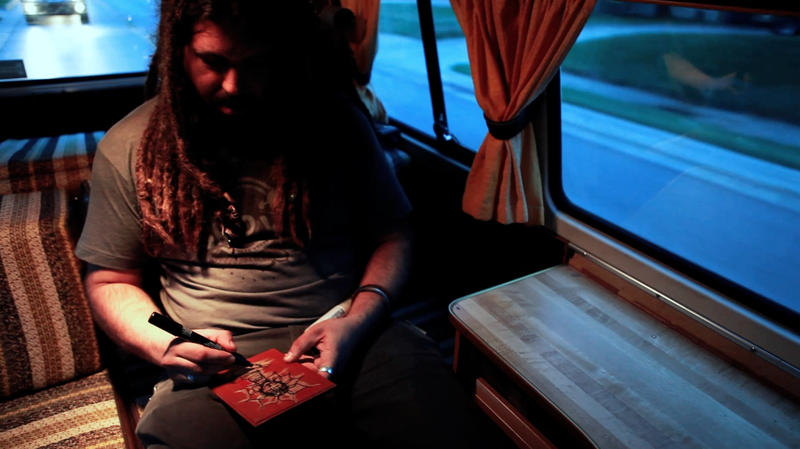 Last month we once again grabbed a talented artist and performed an interview/art experiment in a moving vehicle. We do this every month at Live on the Plaza. Our Plaza District friends chose Sean Vali and we discussed collaboration, Voltron and the energy of the Oklahoma City art scene. Come see us tonight in the Plaza for another night of free fun. Phillip Danner is an artist with a knack for texture. Little did we know that he wanted to create textures inside the Spy Van with office tape, spray paint and even fire. The only thing hotter than the cruel July sun was Danner’s art as he took one of his older pieces and transformed it into something new. This doesn’t come as a big surprise because the artists working at The Society are quite the creative whizzes. It has been a couple months since we’ve had an Okie artist jump into the van for an Artist Interview Session, but we hope this episode starts another wave of sessions at Live on the Plaza. If you’re unfamiliar with Live on the Plaza then please check into the free art and culture explosion that takes place every second Friday of the month. Keep on trucking, readers and watchers. 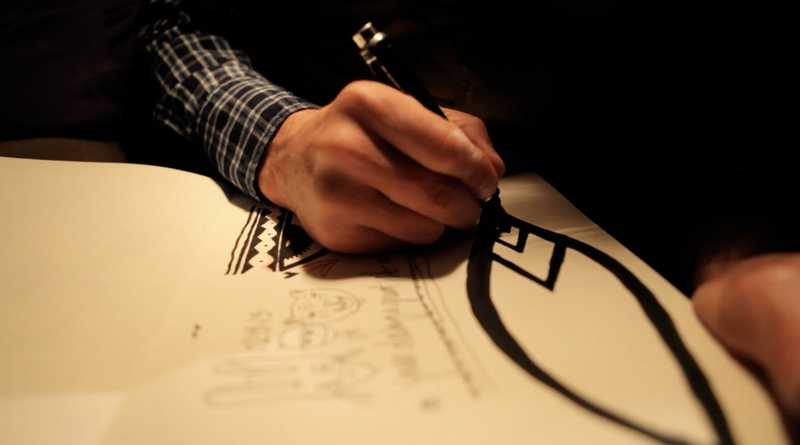 Check out some stills from Danner’s session after the jump. Change doesn’t happen by itself. Lucky for Oklahoma City, we have Kristen Vails working her tail off. She’s spent the better part of four years promoting and revitalizing the district. Vails is the executive director of the Plaza District. If you haven’t noticed, the Spy Van makes a special trip to every Live on the Plaza event to not only have fun but also to film interviews with Okie artists. You can thank Vails for setting up these interviews. For some reason, we’ve waited this long to chat with Vails about her artwork. A lot of her work is based on Vails’ favorite hoofed animal. Take a minute to learn about an Okie that’s all about artwork. Check out some stills after the jump. Flaming Lips roadie and OKC artist Zac Cox hopped into the van for the last session of 2011. We enjoy Zac’s construction paper concoctions and his chocolate milk mustache. Make sure to come out to Live on the Plaza on Friday to catch more local art, and you’ll probably see the van filming another session. Here’s the Vimeo version if you’re fancy.